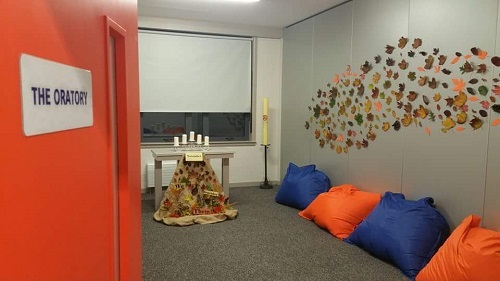 The Chaplain provides pastoral care for students and staff in Tullow Community School and responds to the personal needs of individual students on a day-to-day basis. Students can discuss, in a confidential and supportive environment, any concerns and difficulties they may have. Students are most welcome to drop by the office and chat in a friendly and informal way. This service is student based and follows through to home and family life particularly with regard to illness, bereavement and loss. The Chaplain’s priority is to treat students with respect and dignity in all situations within and beyond the school. The full time school Chaplain is Eimear FitzGerald. She is available to students of all denominations and none, and will be pleased to contact other religious ministers for students at any time. The Oratory is a quiet place for reflection and prayer. If students or staff find the stress, strain and general haste of school life to be too much at times, the Oratory is a place where they can experience silence, reflection and prayer.